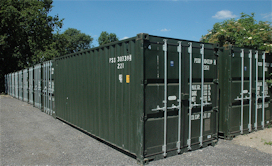 At Hamble Self Storage near Southampton, Hampshire, we offer a simple and immediate solution to all your storage problems. Our site houses individual steel storage units in self-contained compounds, which are security-fenced and under full CCTV surveillance at all times. Vehicular access to the security-fenced site is through an electronically controlled gate with swipe key access. All units are individually locked and each site benefits from overnight floodlighting. We give you the freedom to come and go as you please, from 7am till 7pm, 7 days a week allowing you flexibility, reliability and complete peace of mind.